God seems to speak to me through life experiences. I love that about Him. It makes me realize He really wants to be involved in my day. For instance, I was playing Yahtzee on the computer yesterday and the velvet two-by-four whacked me in the forehead – oh I get it. Let me explain. 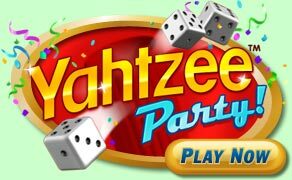 If you have never played Yahtzee, it is a dice game where you roll to get as many as you can of the same number, and then roll for things like full house, four of a kind, straights, etc. A Yahtzee is when you get all five of the same number. You get three roles to a turn. At the end of the rolls, you find a slot to enter your score. At time there may be more than one to choose from, so you have to decide which is the most beneficial. If any of you consider that gambling, I apologize if it offends you. For me, it is an innocent online game. In the game you really don’t win anything except points – no money or prizes. And there was a God-given lesson in it I’d like to share, which shows He can work all things for good. So, I hope you keep reading. Anyway, I began to play. First turn – nothing. I had to put the total in chance, which is like a free space. But is was a measly 13 points. Second turn – nothing. Only two ones. I had to put that in the ones. But you should try for at least three of each to get a bonus and boost your score – that’s the rules. Next turn, nothing again after three rolls. I had to put a “zero” score in a slot. This was not off to a good start. I could have given up. But I kept at it. One by one the slots began to fill. At the tail end, I ended up with two Yahtzees, and because the second was sixes, it also gave me a bonus. I won by having the highest score out of seven other players. I got several wtg (way to go), vns (very nice score)and gg (good game) messages. Because I won, I got to share some of my points with the player of my choice. The next game went smoothly. One by one I easily filled all the slots and got another Yahtzee, but came in third. That’s okay. Okay, so how did this translate into a God message? First of all, if I take on a task I truly believe God has assigned, often times it starts slow. I don’t get the immediate results I’d figure I would. Hey, I’m doing God’s work here. Isn’t this supposed to go smoothly? I could give up, or choose to carry on. When I choose to keep going and see it through, one by one, it all falls into place and He supplies exactly what I need on each “roll”. 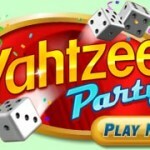 Sure, Yahtzee has a measure of chance involved and with God there are no chances – just certainties – but follow me on this. With each roll I must choose where to put my score, but if I seek His guidance, He will help me with that choice. If I put the roll in the correct place, then in a few more rolls I’ll see that He has given me what I need for another slot. Little by little, my slots will fill with just what I need to succeed. But here is the kicker. I won’t always win. But I will have made good choices and, by using what He has given me just when I need it, I will eventually fill in all the slots He has given for me to fill. Some may have a zero in them, but as long as I don’t give up I will get to the end. That should be my goal. Paul told his followers he had run the good race and fought the good fight. His ministry was anything but a smooth one – after all he was martyred. But he finished and didn’t waver from his mission. In the end, his death didn’t matter because he has eternity at the foot of His LORD and his letters have been instrumental in converting millions over the centuries, and uplifting even more. I don’t know what my end score will be. I just know if I stay in the game, I will finish and it will be to His glory that I didn’t quit when it was not going the way I thought it should. Plus, how it ends is totally up to God, and that will not be in vain either. Each of us have five dice in our hands. Faith, Hope, Love, Patience and Charity. It’s your roll. God will give you multiple chances to do the best you can. He will also give you what you need along the way so you can complete the game with the score He has in mind. And it will all turn out for the best because you hung in there, didn’t give up, and trusted in Him.